Burlington artist Dorsey Hogg said she began to think about artistic identity when she was at Saint Michael's College getting her master's degree in arts and education. In her job as an art teacher, she helped kids draw and paint and mold clay pots, but she hadn't chosen her own special genre. When people asked what kind of art she made, Hogg would say, "a little bit of everything." Then, during a year in Sweden with her sons and husband, who had a temporary position there, she created her first books. Hogg was doing an independent study for her final credits, building a portfolio of work, and realized she had particularly enjoyed the book-art classes she took at St. Mike's. One day in Sweden, Hogg noticed a guy in a large truck swapping out the advertising posters on bus stops and asked him if she could take the old ones. She went home with a stack of 3-by-4-foot colorful posters that touted cellular-service companies, Coca-Cola and hockey teams. She cut them up and turned them into unique, self-contained packages. In one, the panels unfold to arm's length in both directions, like a textile woven from strips of glossy paper. Hogg managed to weave the word "Goodbye," from one of the cellular companies' ads, across the back of the piece. Since then, she's produced dozens of works from books salvaged from dumpsters, attics and even a neglected cupboard of her art room at Georgia Elementary & Middle School. The S.P.A.C.E. 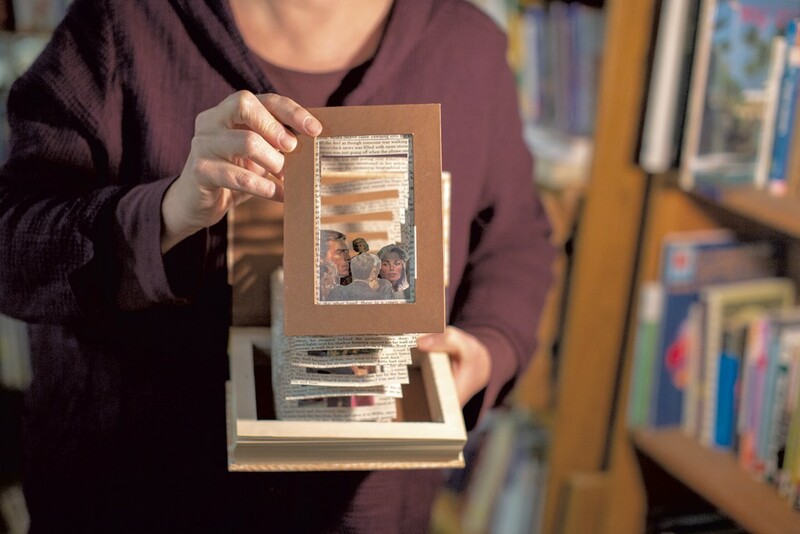 Gallery in Burlington's South End is currently exhibiting two of her tunnel books. To make those, Hogg cuts a large opening on the first page of a book, then makes increasingly smaller holes on succeeding pages. One work, titled "The Faces Tell the Story," is made from an old Reader's Digest. It looks like a long corridor of illustrated faces, all perfectly coiffed and with dramatic expressions, surrounded by the book's text. The cover, forming the frame of the piece, lifts up with all the pages attached like an accordion, showing the details of each layer. Hogg, 48, also has had work in juried shows such as at ArtisTree Community Art Center in South Pomfret. 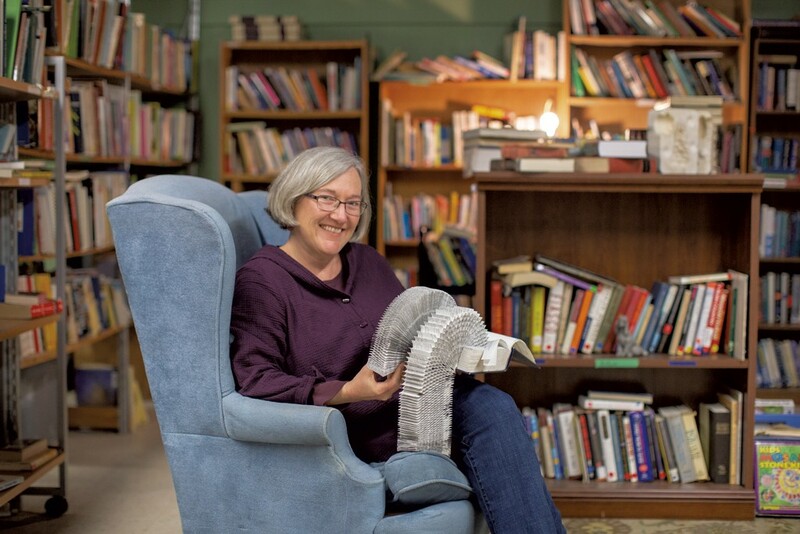 She's a member of the Book Arts Guild of Vermont, which exhibits in venues around the state. Seven Days recently talked with Hogg at her dining room table, where she creates most of her artwork. SEVEN DAYS: What do you like about books as works of art? DORSEY HOGG: To get that idea of play, of opening it up and seeing something that's going to be so different. You can look at it from the back. You can look at it from the front. You can move it around. It can be seen at different angles. I guess I like the engineering component of it, too, just that it works. If you don't do it right, things aren't going to fit together. It gets frustrating after 20 to 30 hours and you realize it's not working. SD: You're destroying books to make your art, but you're saving them from the garbage pile at the same time. What are you trying to say about books by using them? DH: It's transforming these books into something else, taking something and just doing something totally different. Nobody wants the books. You go to [Chittenden Solid Waste District] and there are dumpsters full of books! Where are they going to go? I'm able to take some of these books and give them a new life, and still be able to enjoy the feel of the books and the images and the illustrations. SD: What are your favorite books to work with? DH: I've done a bunch of dictionaries. Nobody uses those copyrighted, outdated dictionaries anymore. They really are on their way to the dumpster, because they're not valued. They've been updated, reprinted. I have come across books, and people have given me books, that I won't cut up. I look at it and I think, That's too cool. They're things that you may not find again. There's an atlas over here — it's a beautiful book with all these foldout pages. That may stay on the shelf. A lot of stuff I do [is with] Time Life books. Everybody had a set in their house. I've done a lot of Reader's Digest condensed books. I just started a series with these crafting books that I found in my art room [at school]. They've been there for 20 years. These books are so dated, but when you start to look at the photographs, they're so cool. They have so much, like, texture in them. SD: What are you currently working on? DH: I like working with rolls. This is a structure I'd like to work more with. I wanted to get the idea of the tapestry of history, turning this book into a cloth of the stories. It's a middle school American history textbook from Georgia that they were throwing away. I hadn't been that inspired to do a history book, and then last spring I realized, with everything going on in politics, [I was] thinking of the story of our nation and where we are going with our history. I cut the pages in strips, and I glued them so they'd be all the same length. And I just rolled them on dowel sticks. I started at one end of the book and went through. I wanted to find pictures that would go together, and also balance it out with text. SD: What does it mean to you to be an artist? DH: I guess it's the working part that has been very meaningful. There have been times when I've thought, If I just go down to the Generator [maker space], I could get this cut out so much faster. It's partly lazy, not going down there to learn how to use the laser cutter, or those things that could make it go a lot quicker. But part of it, too, is I just like working here at my table, just to be at home and spend the hours it takes to cut pages out of a book. Then you see the hole get bigger and bigger and bigger. You've done all that, and there's that pile of pages. And I know that it's my X-ACTO knife that has done it all. The original print version of this article was headlined "Page Turners"